The deadline for registration to be included in the 2016 register (to be publlished on 1 June 2016), is the 26 February. However, the registration process is continuous and graduates may apply for inclusion at any time - the form below may be used for this purpose and should be completed in full and returned to National University of Ireland, 49 Merrion Square, Dublin 2. The deadline for inclusion in the revised register in any given year is 26 February. Graduates who are already registered and who wish to inform NUI of any change of address may do so by email (records@nui.ie), by Fax (01- 439 24 77), by writing to: National University of Ireland, Records Office, 49 Merrion Square, Dublin 2 or by fully completing and returning the form below to, NUI. Changes can not be made over the telephone. Seanad elections take place within 90 days of the dissolution of Dáil Éireann. Based on the experience of previous Seanad Éireann elections, it seems most likely that the 2015 register will be used in the upcoming election. However, this should not dissuade graduates from registering. The current Register, operative from 1st June 2015, contains the names of 103,165 electors. Using the prescribed calculation*, the cost of the 2015 Register amounts to €155.00, either in hard or electronic copy. *Number of 100’s, or part thereof, by which 103,165 exceeds 100 = 1031. Anyone purchasing a copy of the register must undertake to comply with the relevant provisions of the Data Protection Acts of 1988 and 2003 a form is available for this purpose from the NUI office. 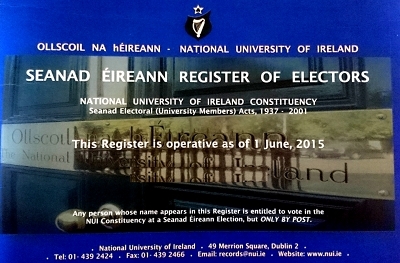 The Seanad Register may be used only for electoral purposes.